The Raffle Quilt is Finally Done!!! 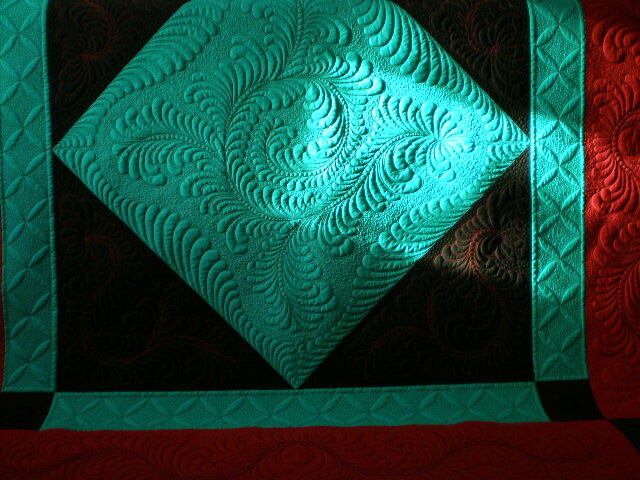 The quilt is 9o x 90, and it is called “Amish Electrified”. I will now pass it along to Janice, another member of our group for binding, it will then go to yet another group member, Shirley for blocking. Then —- I have to decide —- to crystal, or NOT to crystal???? 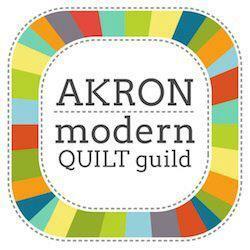 My first thought is absolutely, but I don’t know if the people who will be purchasing tickets for the quilt would want to have them on there?? What do you think?? ← Not doing so well with the upkeep! YES!!!! Use crystals. 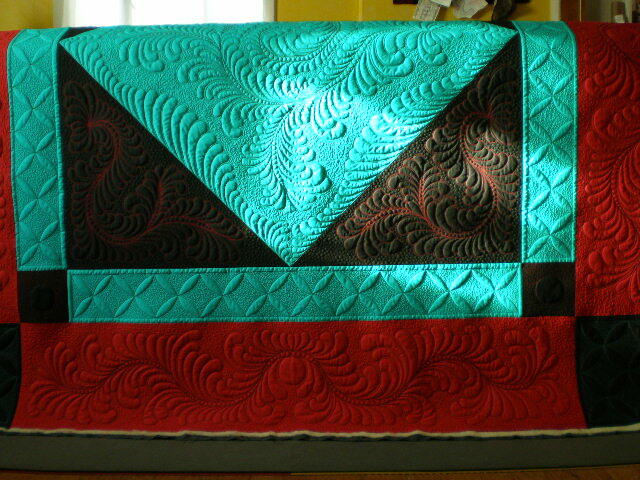 Your feathering is beautiful and I can’t imagine anyone winning this quilt and not putting it on the wall for display! So the crystals could only help, IMO. 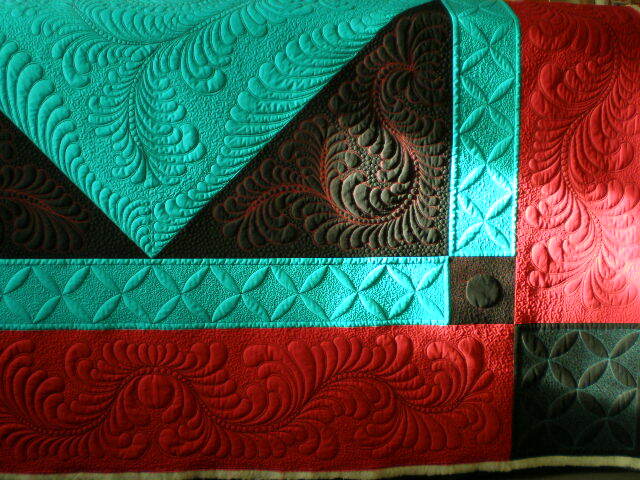 But with or without, that’s one gorgeous quilt. Well done! stunning! crystal! Sell me tickets! Thanks so much for the nice comments Susan and Gina! —-We don’t have any tickets yet , but I’ll post when they are available. I’ve been waiting for this post! 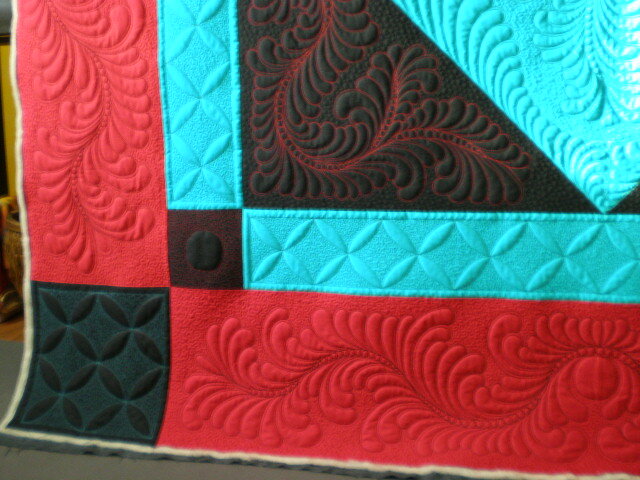 Beautiful, I love the color combination and the stiching. Brenda Miller loves it to and we agree, yes to the crystals, you said “electrified”! Love ya.